This is an artillery hunting radar which was deployed operationally for the first time in April 2002. MAMBA automatically detects, locates and classifies artillery, rockets and mortars and carries out threat assessment based on weapon or impact position. All acquired data is automatically transmitted to a combat control centre. The equipment also incorporates its own basic command, control and communications system for direct control of counter-battery fire. Mamba’s detection range is 20 km (howitzer) and 30 km (rockets) with a circular error probable (CEP) of around 30 metres at extreme range. 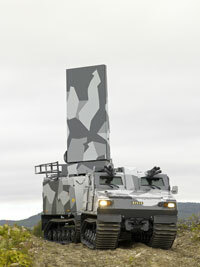 The system, which is mounted on an Alvis Hagglunds BV206 tracked vehicle is easily transportable by aircraft or helicopters. Reports from operational areas suggest that this system has been extremely successful. (possibly 12 available).